This is a continuation of my South Korea trip recap, so be sure to check out part 1 if you missed it. I’ll update this post with the rest of the vids next week when they go up. (Edit: I just heard of the 8.9 earthquake that just hit Japan and hope that everyone is okay over there! Tsunami watch in SOCAL, I cant even believe its real). Going back to my last post regarding the skill level between the regions, I want to clarify that the best players in every region can hang with the best players in every other region. I was simply referring to average skill level among their entire player base. Leading up to the event, we had been playing at Green Arcade a ton and hanging out with the players every night. 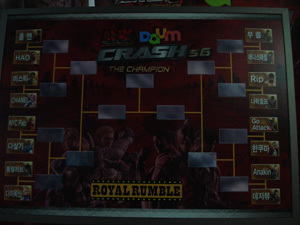 We had dinner with Nin and the Tekken Crash guys where we gave them our info and they told us the entire bracket for the Royal Rumble. From that dinner onward, I knew I was screwed lol because I was going to be playing Narakhof first round and he had owned up both myself and Anakin just a day or two before. I hate when top players use the excuse of ‘not having experience against the character’ but.. MARDUK!? And not just any Marduk, the best Marduk in Korea and possibly the world!? Screwed haha, but needless to say I spent a lot of time on my PSP practicing against the character after Green that night. As you can imagine though, PSP practice mode can only prepare you so much. For the other guys, Fab drew Dasalgi (Steve) and Anakin drew Dejavu (Bryan). From what we heard, Dasalgi hadn’t been playing much lately and Fab used to main Steve so he was confident going into the match. Anakin had played Dejavu previously (and would play him MUCH more leading up to the Rumble) and basically won every match, so he was definitely confident going into his match. The night prior to the Rumble was like any other night (edit: The video at the end of Part 1 was actually from the night before Rumble). We played a bunch and we were as prepared as we were going to be. Full night rest, wake up in the afternoon, everyone was ready/awake on time. Apparently everyone had drank too much the night before though. Fab woke up puking, Anakin brought in some Lotteria and the smell of it made Fab start puking some more. I didn’t puke but lets just say Rip v Toilet went all the way to the final round. 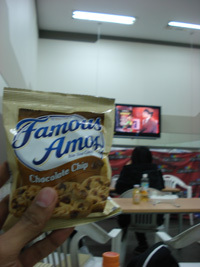 I was overly superstitious this time around, so I actually brought some Gatorade (from America, $3 per small bottle at the airport) + a bag of Famous Amos Chocolate Chip cookies to help me feel like it was just another tournament. 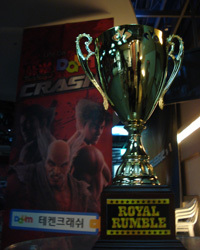 We took a cab over to the MBC Game studio. Somehow Maxi knew how to access the back entrance and walked us in from the back of the set. Seeing the stage was the moment for that me the trip really came together. We had just flown halfway across the planet, to come to this set, to do battle with some of the best Tekken players in the world, and it was about to happen in the next few hours. When we got there, the chairs hadn’t been set out for the audience and all the lighting wasn’t up yet, but the stage was almost complete with both cabinets running and the brackets were up. Just seeing the stage got my adrenaline flowing, it was pretty awesome. 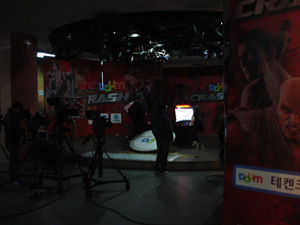 Soon after arrival, the producer came over and gave us some gifts for coming on the show (the clothy Tekken Crash banners you see the audience holding up) and Holeman asked us our shirt sizes and went into a backroom to get us the Tekken Crash shirts (which later they decided we could keep!). We were one of the first people there (since we were the foreigners and they wanted to make sure we had enough time to find the place) so we had a lot of time to kill before the actual filming would start. 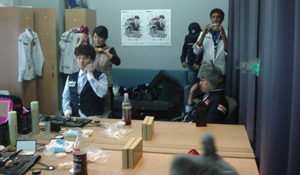 The next place we stopped by was the hair/makeup room. After the makeup we were shown the ‘player waiting rooms.’ Basically behind the stage there are 2 rooms with monitors where the players can sit and watch the show as its happening. There is also one additional staging room behind the curtain that the players wait in before they walk out through the curtain. Soon, more and more players arrived. Maxi filmed some pre-show interviews where I was lucky enough to ask Nin ON CAMERA what he thought about the Korean/Japanese/American scenes (unfortunately Maxi deleted the footage!). An interesting thing about the Korean players is that the veterans of Tekken Crash didn’t even seem to really care about being there. For them it was like just another biweekly local tournament, meh, whatever. For the players who had never been on the show, or had rarely been on the show (Dioxin and Any Special, both of whom I got to speak with quite often actually since they spoke English very well) were verrry nervous. Dioxin had to play Tongbal Love so he knew he was in for a difficult match, and since he had OCV’d Tongbal’s team for SBO qualifiers Tongbal was looking for revenge. Any Special was a really cool guy, but also very nervous about his debut Crash match as it was against Knee. I assume for these guys who aren’t ‘huge names’ in Korea that there is a lot of pressure to do well so you get invited back on the show/help your reputation/get sponsorships etc. For us Americans, I felt that anything was possible in this format, so we just had to play our game and see what happened. Having played in the arcade for so many days prior to the event I felt that any one of us COULD win the event still but that it was unlikely. I don’t think we had as much pressure as the lower-ranked Koreans though because for us it was mainly going to be this one shot with no easy way of being back on the show regularly. After about an hour of waiting around they gave us the ‘orientation’ meeting. Showed us how to walk out of the curtain, stop at this spot, look at that camera, go to your seat, give pad to the assistant to plug in etcetc. Then it was just about showtime. 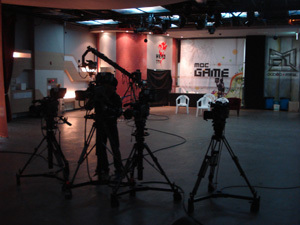 Chairs were all setup, people had been lined up outside the door were now taking their seats, all the lights and cameras were in place, all the players were in the backrooms. They were doing mic checks and testing our entrance music out now and again (The entrance music thing was so random. The night we were at dinner with the producer and Nin, I think Fab asked if we could have them and then they said okay and asked us what we wanted!). Finally, it was SHOWTIME. 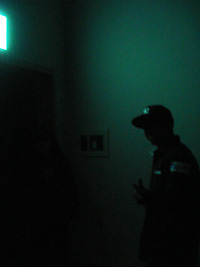 We sat in the backroom by the curtain and watched it live on the monitor in there. 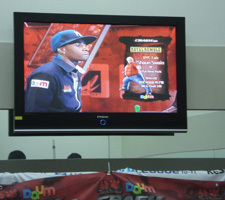 We could hear the music, crowd cheering, and the commentary from the room while watching the screen at the same time. Soon it was Fab’s turn to go up. It was in these matches though that I learned that they do one entire HALF of the bracket at once all the way through until they get one winner. So it was going to be at least another hour before I would have to play. This rollercoaster of emotions (adrenaline when I arrive, calm down, adrenaline when fab goes out, calm down, adrenaline when its my turn) and long wait time was definitely draining, but I knew to stay calm and focused and told myself that my opponent was probably going through the same thing. Plus, I had my Gatorade and Famous Amos, so I was good. I also had my PSP on me and practiced whenever I got too nervous to further calm myself. I had decided that since the odds were against me winning my match that I would at least try to win the fake award of best intro. I rehearsed it in my mind over and over again and finally, it was time for my match. Standing behind the curtain in the dark hallway, jumping up and down to get the nerves out, my music hits, the assistants pull the curtain open, I step through, and the first thing I see.. two rows into the crowd on my immediate right near the middle of the crowd, I see a girl… body half twisted backwards to see me, screaming and waving her hands in the air as if I’m Justin Bieber. My mind – went blank for a second lol. I’m interested to see if I looked confused on that camera 1 now, but the show hasn’t aired yet. 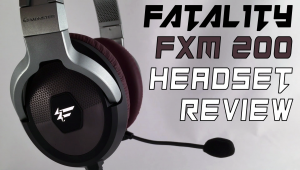 Anyways, I try and focus and do my intro, I think it went well, go up to the stage, get my mind ready for the match. After the girl incident, I couldn’t get myself to look at the crowd again for fear I would lose focus again. Then Narakhof came out, to a HUGE ovation (I can’t wait to see it on the show). 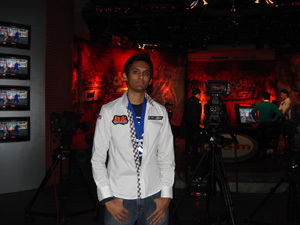 I play the match the best I could, and the crowd was VERY supportive whenever I won a round (which honestly caught me off guard) but Narakhof got the decisive W. Having been on the Evo stage/SBO/and now Tekken Crash, I would say that the pressure of performing to your full potential on each is very different. I would say Evo is definitely the least pressure for me even though it has the largest crowd watching. SBO has pressure because its always so loud all around you from all the different matches around you and you only have that one match to lose before you’re out. Crash’s pressure comes from whole presentation thing (cameras, positioning, crowd, lights, not getting to hit start to skip the round ending replay). I wouldn’t say I was nervous during the match, but there was one moment early on where I dropped a juggle and it was probably the moment I started to hesitate more in the match. I dropped the juggle because of my own input error on pad, one I never make on stick, so I was kicking myself for that, but if I had played on stick the entire match and lost then I would’ve kicked myself for not playing on pad, so I’m happy that I decided to play on pad. Here’s my match! After the match, I stayed and watched the rest of the tournament play out. Interesting to me was that when other top players lost, they would just leave. They didn’t want to stick around and watch the whole thing through to see who would win. It wasn’t that they were upset it seemed more like, oh well, see you guys next time. I’ll stay away from other spoilers for now and update this later, but here’s Anakin’s match as well! 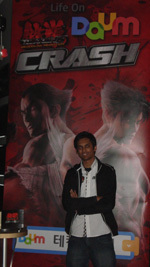 For me, the whole Tekken Crash/Royal Rumble experience was definitely the highlight of the trip. Just being at Green Arcade every single day was also awesome, but I’m not a deathmatcher. I like to have fun once in awhile when I play and I cant get myself to play that seriously continuously. Regardless though, the trip was absolutely amazing and Green Arcade is the craziest Tekken arcade in the world. Huge thanks again to Maxi for showing us around/helping us with everything and to Check 6 Gaming for helping me get there. 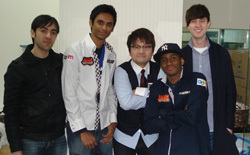 Shoutouts to Luke and all the koreans I got to hang out with and play. 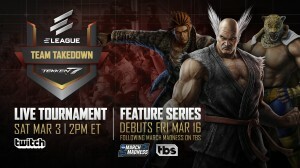 In no order – Nin, Tuhon/2nd Qudans, Barcas, Dioxin, Naengmyun, Any Special, EasyComboMania, Pokemon Secret, Sodam, Holeman, Misty, Tongbal, Knee, Chanel, Dong Dong, Ji3moon Ace, JDCR, Dejavu, Malgu, Narahkof and everyone else whose name I didn’t get. Everyone out there was awesome and I hope to someday make it back there to play you all again! Hey Genki, Thanks for all the feedback, even though its totally offtopic lol. It seems that the majority of what you said could be summarized in an article about 'Randomness' in general, which perhaps someone should do...hMmm.. In general, I do agree with everything you said. Here in Socal, we learned very early in Tekken 6.0 that if someone is in rage theyre going to be looking for launchers, so over time we got used to being defensive about it. I also agree that American players are weaker in terms of movement and thus do play more linear Tekken than Japan/Korea. I especially liked your comments on 'random' sidestepping/backdashing. As K-Keo suggested, you should post this on ATP as well. Its okay if people disagree, but more importantly, I think a lot of people would agree with you as well. they also said, if hopkicks don't launch, then characters that don't have WS punishers like bruce are gonna have problems punishing blocked lows, ducked grabs and high moves. I think there will be no complain if hopkick damage is reduced like combo from low parry. oops! i meant characters that don't have a ''WS launcher'' will have problems launching blocked lows, ducked grabs and high moves. genki you bring up some solid points. you should post this stuff on aris's site. even though people may be biased, it would be a good debate. i do disagree that hopkicks should not launch though. hopkicks have always launched so why would they want to change that? makes no sense to me. in other words, the japanese players said, randomly throwing out hopkicks to crush low pokes and duck jabs is the same as randomly sidestepping and launch to crush linear high, mid, low moves and duck jabs. their risk and reward are the same. cus hopkicks can be punished on block and can be interupted by a jab while in the air and can lead to a full juggle and are easily sidesteppable to launch. and a sidestep launch can be interupted by a tracking or a homing move. they both lead to full juggle with little risk. same applies with random ducking unseeable grabs and high moves and punishing them with a WS launcher. so the japanese players are wondering why the u.s. players are only complaining about hopkicks. they think u.s. players don't know much about tekken and ignorant. Slips doesn't even know he can punish a duck jab by a sidestep and launch! therefore, hopkicks are not the only moves that you can throw out randomly in tekken. there are random sidestep launch, randomly ducking unseeable grabs and highs then punish them with a WS launcher, random backdash launch, random ewgf, jetuppers, snake edge and other launchers. 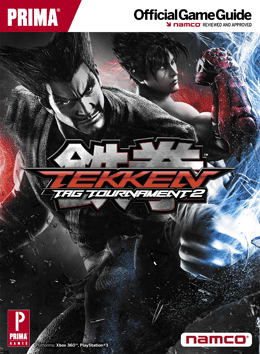 the japanese players said, to be good in tekken you have to be unpredictable like don't mash lows when your opponent is in rage cus you may get hopkicked or sidestep launch, etc, and use your instict when to attack and not to, and outsmart your opponent because most moves are unseeable, so randomness is part of tekken and all fighting games. like for example when you and your opponent are in rage and your opponent threw out an unseeble and you randomly duck and killed him with a WS 4. btw, i'm telling you this and not to aris and slips cus i think they're biased cus their main character don't have hopkicks. i hope you explain this to aris when you see him cus the japanese think americans are stupid for thinking hopkicks are broken. so their point is, if the americans are complaining about random hopkicks, they might as well complain about sidestep/sidewalk, backdash and duck. cus people randomly sidestep and launch and randomly duck unseeable grabs and high moves and punish them with a WS launcher for a full juggle. it's the same thing as randomly throwing out hopkicks to crush low pokes. but sidestep and backdash are better than hopkicks cus sidestep can avoid not just lows, but also mids and highs and 80-90% of a character's moves are sidesteppable/sidewalkable and backdashing at the right range can make your opponent whiff and then launch him. they're also better cus they're whiff confirmable and then launch them. they said if your opponent sidestepped an unseeable move like a 13 frame df+1 and you got launched, then that was random. and if they backdash an unseeable move and whiff punished you with a launcher then that's random. cus they didn't see the move coming. US players have terrible movement compare to Japanese and Korean players, so they won't complain about sidestep/sidewalk because US plays 2-D Tekken. Ease of use is bigger factor for Americans like hopkicks. but if americans play against japanese or koreans they would complain about getting their jab, mid poke and low pokw sidestep launched and backdash launched. they should realise tekken has been like this ever since, a small whiff or mistake can lead to 50-60% percent damage. they shouldn't blame the system, they should blame theirself for having bad movement, predictable, etc and lack of knowledge of the game. cus i think only u.s. players have problems with hopkicks. all the japanese players i've asked had no problem with hopkicks and they chuckled cus when i said they're complaining about random rage hopkicks, they think u.s players don't know how to get around hopkicks, slow at punishing them, and predictable, they said, if your opponent is in rage and you have lots of life, don't low poke. just throw mid attacks or just backdash to make it whiff since most hopkicks lack range or wait for them to hopkick, then punish it. you should always watch out for hopkicks when your opponent is in rage they said. oh...part 2 is already up. lol. i got linked from another website to part 1 so i didn't realize part 2 was up. thanks for this write up man! i like how it was very detailed. i hope to one day be able to go there someday. it seems like a great place to be. 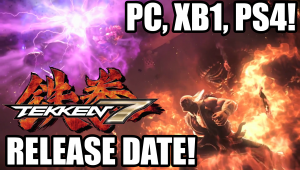 nice people......hot girls......tekken. sounds like paradise! Thank you so much for this recap Rip, can't wait to see the rest of the show!! Awesome way to end the recap with such intimate details of what the Royal Rumble was like and how you got the intro music! Looking forward to watching and uploading the second part of the Royal Rumble!